What a scorcher! Well, at least it reached the balmy heights of 17 degrees last Bank Holiday Monday with uninterrupted sunshine which, as well as reinforcing Eastbourne’s record as the sunniest place in the UK, also turned my chest a tasty shade of pink when I naively exposed it for 45 minutes while fishing from the beach. Will a gingerman ever learn?? 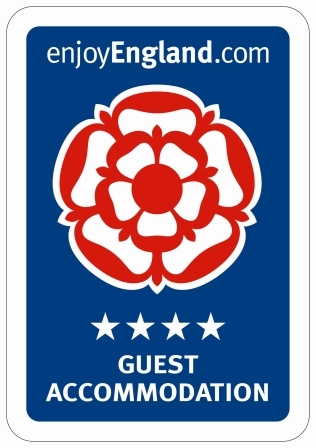 And we’ve just had our annual review from Visit Britain who have awarded us with a 4-star silver-rated award (despite them apparently raising the bar on standards). ‘Housekeeping shows meticulous attention to detail in all areas’, with a 100% score for cleanliness, so our girls are particularly chuffed knowing that they will be rewarded with a fully expensed night out for their continued hard work. And the swanky upgrades to most of our suites have all been recognised as highlights in the report so there’s a happy crew in place at this Eastbourne B and B for the busy summer ahead. Sarah will be dusting off her catsuit given that Abba (or a rough approximation) are returning to the bandstand this Friday, closely followed by Take That the following week so it would be rude not to throw a few moves and revive the Stanger Shuffle for the assembled crowds. Guests have been enjoying the Seven Sisters Sheep Centre recently, with many a lamb still gamboling, the Dotto is back on the seafront (‘Yay!’, I hear you cry), and with sea temperatures on the up the waves are now starting to beckon! Ahh, summer is almost upon us. We’ve also been sampling some new restaurants and are ready to pass on some tempting new recommendations so I suggest that give us a call on +44 (0)1323 722774 or book online here to check out the swanky upgrades for yourself at The Guesthouse East.